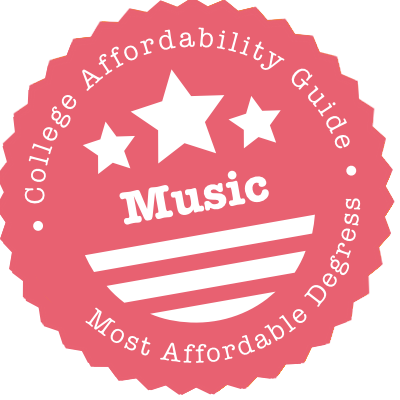 Scroll down to see the most affordable music degrees, as well as info on the different types of music degrees and music program accreditation. The Bachelor of Arts program at the Claire Trevor School of the Arts includes coursework in music history, performance, composition, and music theory. A Bachelor in Music in Performance degree is also available, with specializations in piano, vocal, jazz, and guitar & lute performance, as well as performance in standard orchestral instruments. The school offers a Master of Fine Arts in Music program with emphases in collaborative piano, instrumental performance, musicology, guitar & lute performance, and vocal arts. The MA/PhD in Music program is a new degree, and offers a single specialization in Integrated Composition, Improvisation, and Technology (ICIT). The Ann and Gordon Getty Foundation Music Scholarship awards up to $500 to qualified music students in instrument or voice. The University of Minnesota-Duluth's Department of Music not only offers students instruction from faculty who are specialists in their instruments and fields, but the school is dedicated to bringing in guest artists in residence to provide additional instruction. The school offers a Bachelor of Arts in Music or Bachelor of Music in Music Education, Theory and Composition, Jazz Studies and Performance, with a Master of Music in Collaborative Piano, Conducting, Music Education, and Performance. Performance degrees are offered in instrumental and vocal music. More than 200 concerts are presented each year, with a variety of ensembles, orchestras, choral groups, and bands. Talent scholarship awards vary annually and include the Barnard Jazz Scholarship, Opheim Choral Scholarship and Nord Music Education Scholarship. Texas A&M University at College Station's Department of Performance Studies offers a Bachelor of Arts degree in Music through an interdisciplinary, liberal arts curriculum. Students not only study music performance and composition, but also theory, history, and technology. Ethnomusicology provides a study of the relationship between a culture and music as well as societal influences on music development. The "Fighting Texas Aggie Band" is the school's flagship band, performing across the country. There are also four concert bands, two jazz bands and two orchestras, multiple choirs, and smaller ensembles. Students have access to a recording studio, computer laboratory, and performance venues, with professors offering individual instruction studios. Study abroad programs are also available. The University of North Carolina-Chapel Hill Department of Music offers flexible undergraduate degree options with a Bachelor of Arts and Bachelor of Music. The BA requires fewer hours and allows students to pursue other interests in concert with their Music education. The BM is an intensive study in music, with required ensemble performance. The graduate program offers a Master of Arts and Ph.D. in Musicology. A variety of student bands and ensembles perform during the year. The school offers two large performance venues along with rehearsal space, practice rooms, and two computer labs. The Kenan Music Scholars Program provides four years of tuition support for undergraduates as well as funds for enrichment activities. Additional named scholarships are also awarded. The Herb Alpert School of Music at UCLA offers a Bachelor of Arts (BA) in Music program with concentrations in composition, music education, and performance. There is also a BA in Music History degree as well as a BA in Ethnomusicology degree with concentrations in jazz studies and in world music. On the graduate level, Master of Arts and Doctor of Philosophy degrees are available in ethnomusicology, musicology, and music composition. Master of Music and Doctor of Musical Arts programs are also offered. The UCLA Herb Alpert School of Music Student Opportunity Fund provides financial assistance for student travel to performances, camps, and conferences. Up to $1,000 of related expenses can be reimbursed for travel outside the United States. UIC offers Bachelor of Music degrees in Performance and Jazz Studies, as well as Bachelor of Art degrees in Music and Music Business. The School of Theatre & Music has scholarship money for talented performers; awards are worth between $200 and $6,000 and typically specify the performance type. For instance, the Chicago Bar Association funds four separate awards - one each for instrumentalists, pianists, vocalists and jazz musicians. Students who qualify for Federal Work Study can angle for a research assistantship with the department, which occasionally hires students to help in other roles, such as managing the box office. Students earning an undergraduate degree in music at Baruch College study music literature, history, theory and musicianship, and develop an appreciation of the historical and cultural context of musical styles. The program is intended to give students a solid foundation for continued studies. All music majors are expected to participate in a performing group sponsored by the music department. Baruch also offers an interdisciplinary specialization for music majors, Management of Musical Enterprises, which allows students to combine an interest in music with business courses. To complete the Management of Musical Enterprises program, students must participate in the intern program supervised by the Fine and Performing Arts Department. The Music Department at Vassar runs a standard undergraduate major that covers four areas: theory, history, composition and performance. The first three can all be taken as minors, or "correlate sequences" as they're called on campus; Music and Culture is also a correlate sequence. The department has special scholarships to cover performance-related costs for meritorious students with financial need. Students who receive financial aid can apply a music scholarship toward credit-based lessons in one instrument per semester; those lessons would otherwise cost $710. Musicians at UC Riverside aren't confined to campus. Through the Gluck Fellows Program, they can venture out to lead workshops and perform for underserved communities. Undergraduate fellows receive $1,000 in compensation, and graduate students earn $5,000. The $2,500 Gianos Family Music Award goes to undergrads with financial need. Undergrads working toward a BA in Music or Music and Culture may also be interested in conducting research with faculty at UCR's Center for Iberian and Latin American Music. The same goes for grad students getting a MA/PhD in Music, which comes in three specializations: Digital Composition, Ethnomusicology and Musicology. In addition to Gluck Fellowships, PhD candidates can secure assistantships and scholarships, often through the Friends of Music Fund. The Department of Music at UC San Diego offers three Bachelor of Arts programs: BA in Music/Humanities, BA in Music, and BA in Interdisciplinary Computing and the Arts - Music (ICAM). The BA in Music degree offers concentrations in composition, performance, literature, technology or jazz, and the music of the African diaspora. The BA in Music/Humanities degree focuses on music history and literature within the broad field of the humanities. The ICAM program combines ideas and archetypes from art, computer science, and cultural theory. Master of Arts and Doctor of Philosophy degrees in music are also available. The Doctor of Musical Arts (DMA) degree offers a concentration in contemporary music performance. Music majors can apply for the Diana C. Miles Scholarship ($2,000). The University of Minnesota-Twin Cities School of Music provides instruction to foster creative growth and scholarship in a variety of musical disciplines. Degree offerings include a Bachelor of Music in Music Education or Music Therapy and a Bachelor of Arts in Music. A Bachelor of Music in Performance is offered in guitar, harp, organ, piano, strings, woodwinds, brass, percussion and voice. A Master of Music is offered with Doctoral degrees in Music research and practice. The school is one of the few programs in the nation with an on-campus music therapy clinic. Ferguson Hall provides concert venues, an organ studio, and electronic music studio. Merit-based scholarships awarded by the school range from $1,000 to $6,000 and require an audition. The Music Department at Buffalo State grants a Bachelor of Arts in Music for students who want a career in music. Students who want to teach music can earn a Bachelor of Music in Music Education; an online Master of Music Education is also available. Music students take a least four semesters of individual vocal or instrumental lessons and participate for at least six semesters in a college ensemble. Buffalo State performance ensembles include a philharmonia, chorale, digital music, West African drums, jazz vocal, and guitar ensembles. Music scholarships are awarded based upon the audition a student performs when applying for admission to the music program. Many of the music scholarships are renewable for up to four years. The Music Department at SUNY Oswego grants a Bachelor of Arts in Music that requires students to earn at least 38 credits in music classes. Students take 26 credits in core requirements including aural skills, music theory, and history of music. The other 12 credits are in a track: generalist, jazz studies, audio recording and production, or performance studies. All music students must have at least four semesters of individual instruction, four semesters of performing with a college ensemble, and they must pass a piano proficiency test. Students do not have to pay extra for private studio music lessons. The building housing the music department has been recently upgraded and includes a large concert hall, recording studio, and MIDI lab. UC Berkeley's Department of Music offers a Bachelor of Arts degree in music with an extensive list of elective courses which allows upper division music majors to craft an individual plan of study that supports their interests and career plans. Students interested in post-baccalaureate study in music can pursue the MA/PhD in Music degree. Students accepted to the program can earn an MA enroute to the PhD, however, Berkeley does not offer a terminal master's degree in music. The program has three areas of specialization: composition, ethnomusicology, and music history and literature. There is a stand-alone doctoral program for applicants who already have an MA degree. Students are supported by fellowships and teaching assistantships, which typically include tuition waiver and a stipend. Students accepted to the Bachelor of Arts in Music program at UC Davis can choose to specialize in one of the following three tracks: performance, composition, or music history, theory, and ethnomusicology. The Department of Music also offers a Master of Arts in Conducting program. In addition to learning about musical analysis and issues of performance practice, students also gain practical experience in the preparation of performance materials. The Doctor of Philosophy in Music degree offered at the unniversity has two areas of emphasis - musicology and ethnomusicology or composition and theory. Students with demonstrable financial need can apply for several university-wide scholarships with unrestricted eligibility, such as the Bettencourt Memorial Scholarship and the Percy W. and Nellie C. Thompson Scholarship. Vocalists and instrumentalists alike will be heartened to hear that Westfield has two awards just for them: the Dower Scholarship for Music and the Manzer Music Scholarship, both awarded based on talent and academic results. Pianists, meanwhile, rave at Westfield's status as the only public university in New England with the All-Steinway School designation. The Music Department displays a diverse arrangement of degrees, ranging from Composition to Jazz Studies to Music History. And, of course, there is a track for performers. In fact, the department maintains a packed calendar, which includes a recital series, jazz and percussion ensembles, and musical theatre. Bonus: Musical Theatre Guild members with financial need are eligible for an additional scholarship. The Music Department at SUNY Oneonta has two majors: music and music industry, which includes classes in business and law. Music industry majors are required to work an internship, and they can get hands-on experience through the Music Industry Club, which books concerts and runs a record label that records a student act each year. The department organizes a trip to the annual conference of the National Association of Music Merchants, where music industry majors can network. Auditions are required for students seeking a Bachelor of Arts in Music, but not for music industry majors. Performance ensembles include an a capella group, drumline, opera group, and gospel choir. Students also share interests through organizations such as the Jazz Appreciation Society. The Hayes School of Music at Appalachian State University offers undergraduate degrees in Music Education, Music Performance, Music Therapy and Music Industries Studies, a Master of Music in Performance and a Master of Music Therapy. The Music Industries Studies program prepares students for jobs in the music industry such as recording arts, artist management and promotion, and music merchandising. Students in the program help run the department's record label and have access to a multi-million-dollar recording studio. Students must pass an audition to enter any degree program offered by the Hayes School of Music, and all students must perform in at least one ensemble each semester. Scholarships include the Paris Weathers Scholarship ($1,000) and the John F. Konen Scholarship ($1,000). Seventeen instrumental ensembles and six vocal ensembles offer students of the University of Massachusetts-Amherst Department of Music and Dance more than 200 performance opportunities each year. Students can choose a Bachelor of Arts in Music or Music Education, a Master of Music in Music Education or Music Performance, and a Doctor of Philosophy in Music Theory. The school's participation in the Five College System provides access to courses at partner schools and additional ensemble opportunities. Music honor societies and Greek organizations provide community outreach participation and extracurricular involvement. Chancellor's Talent Awards for full in-state or partial out-of-state tuition, are awarded to 25 students each year based on merit. Other scholarships include the Bester and Morgan awards. St. Cloud University grants a Bachelor of Science in Music Education for those who wish to teach in elementary or secondary schools, and it has been very successful in placing graduates in teaching jobs around the Midwest. Students more interested in performance, private teaching or attending graduate school can earn a Bachelor of Music in Vocal, Piano, or Instrumental Performance. St. Cloud also has a pre-professional program for students who plan to go on to study law, medicine or business but who want to study music for their undergraduate degree. Scholarships for music majors include the Andrea Arriagada-Hernandez Memorial Scholarship ($1,000), the Mildred E. McGonagle Vocal Music Endowed Scholarship ($500) and the May Bowle Music Scholarship ($500). The Music Department at Wayne State College offers bachelor's degrees in music history and theory, music performance, music industry and music education. The music performance major is designed for students pursuing careers as performers or music instructors. The music industry major prepares students to operate music stores, sell musical equipment, work in the music recording industry or other music-related industries. Students interested in teaching music can major in music education with endorsements in K-12 music education, K-12 instrumental music education and K-12 vocal music education. Music majors at the College have access to various resources, such as a piano/computer laboratory, popular music software and a 600-seat performance hall. The Department of Music at WSC is accredited by the Association of Schools of Music. The College of the Arts (COTA) at CSU Long Beach offers the following baccalaureate degrees in music: Bachelor Arts in Music, Bachelor of Music - Music Education, and Bachelor of Music. Students in the music education program have two options - instrumental music or choral-vocal music. The Bachelor of Music program offers the following options: performance, composition, and history and literature. The Master of Arts in Music program offers academic concentrations in musicology, music theory, and music education. The Master in Music degree offers professional concentrations in the following areas: composition, conducting (instrumental and choral), jazz studies, opera performance, and instrumental/vocal performance. COTA awards several scholarships (ranging from $500 to $5,000) to qualified students enrolled in any of their programs. Students accepted to the Bachelor of Arts in Music program at McDaniel College can choose from the following areas of specialization: music theory and composition, music history and literature, and music with a minor in education. In addition to completing the required coursework for the music major, BA students must pass piano and aural proficiency exams before proceeding to higher level courses. The specialization in music with a minor in education leads to PreK-12 music certification in four years. A combined BA/Master of Science in Music Education program allows students to earn both degrees in just five years. Students who complete the program are also eligible for teacher certification. The college offers a dual major in music and theatre as well. Winona State's Department of Music features multiple majors, including performance, business and education. Performance majors choose between instrumentals, piano and vocals, while education majors choose between instrumentals and vocals. Those in the education track take extra credits, leading to a fifth year as a student teacher. Students who want more room for non-artistic pursuits can take a Liberal Arts-infused degree. All students are eligible to attend the annual scholarship audition, which includes a music theory exam and aural assessment. That audition can double as an admission tryout. Some of the awards are renewable, others not; they are worth between $500 and $3,000. Music majors at SUNY University at Albany can earn a Bachelor of Arts in performance, vocal performance, composition, or conducting. Degrees are also available in musicology and theory. The Music Department has an array of performance ensembles, both vocal and instrumental, as well as a pep band. The department doesn't require general music majors to audition, but music performance majors must audition by performing before a jury after their first semester of lessons. Music majors are encouraged to double-major, and the department offers a minor in music. The department grants several named scholarships, including the Andrea Hanan Music Scholarship, given to a first-year student, and the Hastings Award, typically given to a senior concentrating in the piano. The Music Department at Stony Brook University is staffed by professional musicians who continue to perform and who share an appreciation of contemporary and new works. All undergraduates work toward a Bachelor of Arts in Music with no specific tracks, so they gain a broad musical education while taking electives that match their career interests. The department grants an M.A. and Ph.D. in History and Theory of Music and in Composition, and a Master of Music and a Doctorate of Musical Arts in Performance. Music facilities on campus include electronic and computer music studios, reflecting the school's support of electroacoustic music. To major in music, students must pass an audition. Most departmental scholarships also require an audition. Iowa State University offers a Bachelor of Music with the option to concentrate in Performance, Composition or in Vocal or Instrumental Music Education. Students are required to audition before they can be accepted into the music program. The department also offers a minor in Music Technology, and graduate studies in Interdisciplinary Electronic Arts Cluster. The Music Department is housed in a dedicated building that is equipped with an electronic music studio, re cording equipment, and practice rooms. The department owns four pipe organs, a harpsicord and a carillon. Ensembles open to students include a syphony, jazz band, marching band, flute choir and several vocal groups. Scholarships for music students are based on an audition. The University of Florida offers Bachelor of Arts, Bachelor of Music, Bachelor of Music Education, and Master of Music degrees in Music with specialization in brass, keyboard, percussion, strings, woodwinds, and vocal music. Other degree options include the Bachelor of Music Education, Master of Music, and Ph.D. degrees and a Bachelor of Arts, Bachelor of Music, Master of Music and Ph.D. in Composition, Theory and Technology. Ensembles range from the Men's Glee Club and Women's Chorale to jazz bands and the University Symphony Orchestra. The school requires auditions by all students who wish to apply as music majors. These are used in scholarship determinations, as well. Scholarships include the Friends of Music ($200 to $1,500), Pitts Memorial ($650) and Reitz Scholarship ($1,000). Berea College offers Bachelor of Arts degrees in music and music education with vocal or instrumental emphasis. A six-course minor in music is also available. Students in both B.A. programs are required to complete a core curriculum that includes eight theory skills courses, three music history and literature courses and applied skills courses in piano, voice or another primary instrument. Music majors also complete a capstone course in the form of a senior seminar. Music education majors earn P-12 teaching certification, which includes student teaching. The Music Department offers numerous performance ensembles for vocalists and instrumentalists. Vocal performance ensembles include the Black Music Ensemble, Concert Choir, Chamber Singers and Women's Chorus. Instrumental performance ensembles include the Bluegrass Music Ensemble, Jazz Ensemble and Wind Ensemble. The Music Department at Binghamton University offers bachelor's and master's degrees and maintains a busy concert calendar. Undergrads planning a career in music can earn the Bachelor of Music in Performance, while students seeking a wider liberal arts degree can earn the Bachelor of Arts in Music. The Bachelor of Music is an intensive program requiring 86 music credits, and students must audition for admission. The Bachelor of Arts requires 48 music credits, and no audition is required. The Master of Music program offers several areas of emphasis: Conducting (choral, orchestral, or wind band), Composition, Collaborative Piano, Instrumental Performance, Music History and Literature, or Vocal Performance. Binghamton also offers a Master of Music in Opera in collaboration with Tri-Cities Opera. The College of Music at Michigan State offers Bachelor of Arts and Bachelor of Music degrees in Composition, Music Education, Performance and Jazz Studies. At the master's level, students also can specialize in Conducting, Music Theory, and Musicology and Ethnomusicology. The college also awards doctoral degrees in Composition, Conducting, Performance and Music Education. Students who desire to perform in a college ensemble will find opportunities range from a concert band and chorale to a group that presents innovative new music utilizing theatrical media. Jazz musicians have the opportunity to perform in a traditional big band or a small quartet. To be admitted into the College of Music, students must perform an audition, which is also considered for scholarship awards. The Aaron Copland School of Music at Queens College offers bachelor's and master's degrees in general music, performance, and music education. All practice rooms are equipped with Steinway pianos, and the department has use of the LeFrak Concert Hall, which is known for excellent acoustics. No matter which degree they are pursuing, all undergraduates learn music history and theory and gain the skills of ear-training, sight-singing, and performance. Undergraduate degrees include the Bachelor of Music, open by audition to instrumentalists and singers who want to study performance, and the Bachelor of Arts with Music Education. Graduate students can earn a Master of Music in Classical Performance or in Jazz Studies, or a Master of Science in Music Education. The School of Music, Theatre, and Dance at UNC Greensboro offers music degree programs on the baccalaureate and graduate levels. Students can pursue Bachelor of Music degrees in performance or in music education. There is also a Bachelor of Arts in Music program available. Students accepted to the Master of Music program can choose from four areas of specialization: music performance, music education, music theory, and music composition. The university offers two doctoral degrees in music - Doctor of Musical Arts - Music and Doctor of Philosophy in Music Education. Post-baccalaureate certificates are available in the following: music theory, musicology, ethnomusicology, composition, jazz, and music education. There is also a post-master's certificate in music theory pedagogy that is open to DMA and PhD students. CSU Fullerton's BA in Music program has concentrations in music education and in music history and theory. The music education concentration has three areas of emphasis (choral, instrumental, and general music) and prepares students for careers in teaching music. The Bachelor of Music degree has concentrations in composition, instrumental, keyboard, voice, accompanying, jazz and commercial music. A two-year post-baccalaureate Artist Diploma certificate is also available, in addition to MA in Music (with emphasis in music history and literature, music education, and piano pedagogy) and Master of Music programs (with emphasis in performance and in theory composition). The following music scholarships are available: Bridgford Family Fund Scholarship ($2,000), Alan A Mannason Scholarship for Composition ($1,000-$2,500), and the Elaine Redfield String Scholarship ($2,000). The Music Department at Brigham Young University in Idaho offers four different undergraduate degrees in music: Bachelor of Arts, Bachelor of Musical Arts, Bachelor of Music in Performance, and Bachelor of Music in Education. Areas of emphasis include brass, composition, voice, jazz, woodwinds, organ, percussion, strings and piano. All music majors must audition, and the department uses auditions to help determine scholarship awards. With 27 different musical ensembles on campus, every student musician has many opportunities to perform. The university also commissions new oratorical works from religious composers. The Music Department offers students the opportunity to study abroad through its European Travel Study program. The school is accredited by the National Association of Schools of Music. The Department of Fine and Performing Arts at Northwest Missouri State University offers a Bachelor of Arts in Music, as well as Bachelor of Music Education degrees in instrumental music education and vocal music education. The B.A. in Music is designed for students who want careers in music but not in public school education. Students in the Bachelor of Music Education program are prepared to teach instrumental or vocal music in PK-12 classrooms. The instrumental music concentration requires 57 major credits, while the vocal music concentration requires 55 major credits. Music degree programs at NMSU are fully accredited by the National Association of Schools of Music. The Music Department at City College of New York offers a wide range of bachelor's degrees, including a Bachelor of Arts in Music, and Bachelor of Fine Arts programs in Jazz Performance (instrumental or vocal), Sonic Arts, Classical Vocal Performance, and Classical Instrumental Performance. Students must be accepted into CCNY as a general student before applying to become a music major, and students who wish to major in performance must pass an audition. The Music Department's facilities include a recital hall, individual and group practice rooms, a music library, piano lab, and performance center. Students in the Sonic Arts program have access to production studios, control room, and sound lab. Many of CCNY's 300 music majors are non-traditional students. The Music Department at Hunter College grants a Bachelor of Music and Bachelor of Arts in Music and has a master's program. All undergraduates receive training in performance, the history and theory of music, and aural skills; other music subjects are offered as electives. Undergraduates must pass placement exams in basic music history and theory and have their performance skills evaluated at an audition. Students in the Master of Arts in Music program can concentrate in composition, ethnomusicology, music history, music theory, performance, or music education. It is possible for a master's candidate to combine two concentrations. Graduate performance or music education majors must audition, and students in the other concentrations must submit work samples when they apply for admission. The Bachelor of Science in Music Therapy at Texas Woman's College is one of the oldest music therapy programs in the nation, combining study of music with clinical experience, research and core courses in psychology, special education and biology. The Department of Music also offers a Bachelor of Arts in Music Education and Music Performance. All music students are required to audition for placement in the program, followed by an assessment of music theory and sight singing. There are nine instrumental bands or ensembles that provide performance opportunities and five vocal ensembles. Scholarships include the Bellamy Endowed Music Scholarship, Bently Music Scholarship Endowment, Coffey Endowed Scholarship, and the Betty King Music Scholarship, with a preference to music therapy majors. The Conservatory of Music at Brooklyn College offers a variety of degrees including a Bachelor of Music in Music Composition, Music Education, or Music Performance, as well as a Bachelor of Arts in Music. Graduate programs include a Master of Music in Composition or Performance, a Master of Fine Arts in Media Scoring or Sonic Arts; a Master of Arts in Musicology or Music Teacher (all grades), and advanced certificates and diplomas in music performance. The college is building a $10 million performing arts center that will include performance spaces, rehearsal rooms, classrooms, set workshops, and a theater. The conservatory has more than two dozen named scholarships for music students, including the Liberace Foundation Scholarship for piano majors. The Music Department at SUNY Plattsburgh offers a 45-credit Bachelor of Arts in Music and a 35-credit music concentration that is open to students majoring in elementary education or special education. To enter either program, a student must audition and be interviewed by the music faculty. Facilities available to music students include a MIDI lab, a music technology/piano lab with seven workstations for audio production and 17 digital pianos, a music library with 32 listening stations, teaching studios, practice rooms, large and small rehearsal halls, a 789-seat auditorium and a 162-seat recital hall. Performance ensembles include a chamber choral group, large mixed chorus, big band, chamber string ensemble, symphonic band, several chamber ensembles, and a gospel choir. The College of Music at the University of North Texas offers bachelor's degrees in composition; instrumental performance (orchestral instruments or multiple woodwinds); jazz studies (instrumental, arranging, or vocal emphasis); keyboard performance (organ church music, organ, harpsichord, piano pedagogy, piano); music education; music (history and literature); music theory; and vocal performance. They also offer M.M. degrees in conducting, jazz studies, music education, and performance; an M.A. in music; D.M.A. degrees in performance, conducting, and performance - jazz studies; and Ph.D. degrees in music and music education. Many graduates of these music programs become teachers and scholars, performers in bands and orchestras, employees in the music industry, and composers in television and film. Students may apply for competitive music merit scholarships. Students who are interested in pursuing a Bachelor of Music degree at Stanislaus can choose from the following emphasis areas: music education (instrumental and choral), piano performance, instrumental performance, vocal performance, jazz performance, and composition. There is also a Bachelor of Arts in Music program available, with a curriculum that covers general music and music technology. The department also offers a minor in music as well as a concentration in music for students with a Liberal Studies major. Several scholarships with variable amounts are available for Music majors, including the following: Alan & Bonnie Strauss Music Scholarship (all concentrations), David S. Goedecke Music Scholarship (instrumental music), Leslie L. Szarvas Memorial Scholarship (music composition), and the American Choral Directors Association Scholarship (vocal performance). Students accepted to the Bachelor of Arts in Music program at Cal Poly Pomona can choose to concentrate in one of the following fields: music education, music industry studies (recording, production, and the music business), and music performance (vocal, instrumental, commercial music, and musical theatre). Music majors are given several opportunities to enhance their classroom instruction through internship programs, master classes with world-class artists, and field experiences in teaching. The Music Department stages more than 50 events/concerts each year, including department ensemble concerts and faculty/staff artist concerts. Students have several scholarships for which they can apply, including the Ella Fitzgerald Memorial Scholarship ($5,000) for full-time students with financial need enrolled in Jazz Band, Jazz Combo, Choral ensemble, or Songwriter Showcase. Music graduates do much more than play music. Sure, you’ll find plenty of grads in world-class orchestras and opera companies, but you’ll also meet them in schools, hospitals, recording studios, nightclubs, churches, and computer labs. They work as jazz singers and rap artists, sound engineers and technicians, film composers and video game developers, arrangers and orchestrators, talent agents and arts administrators. They provide music therapy to children and adults with special needs and instruction to students of all ages. We know it can be hard to pick a music program – especially one that’s affordable! – so we decided to create a quick guide to choosing a degree. Here you’ll find information on everything from majors and coursework to careers. We explain the differences between the BMus, BFA, and BA, explore the fields of music education and music therapy, and discuss potential entrance requirements (including the dreaded audition). You’ll also find clear information on important accreditations, licenses, and certifications. An associate’s degree in music is a 2-year undergraduate program that focuses on core general education and music courses. These degrees are offered by a variety of community colleges, technical schools, and universities. Some programs are strong in performance and production, with famous music professionals on the faculty; other programs are built around music education or sound engineering. Regardless of the program, a high school diploma or GED is needed to apply. A lot of schools will also require you to pass an audition. The AA is the equivalent of the first two years of a bachelor’s degree, and many music students use it to earn credits for a BMus or a related undergraduate degree. If you’re thinking of this option, check that your community college is recognized by and/or has an articulation agreement with the 4-year school you’re interested in. In other words, you want to make sure your credits will be transferable. We advise this because some colleges and universities won’t accept credits from a community college with weak music theory and skills courses. In addition, even if there is an articulation agreement in place, you will have to apply and audition again. Students in AA/BA programs may find it easier to complete their bachelor’s degree in 4 years than students in AA/BMus programs, who have to complete rigorous theory and ensemble/lesson courses. Associate of Arts (AA) in Music: The typical choice for students interested in transferring to a BA or BMus at a 4-year university. Associate of Science (AS) in Music: An option for students interested in transferring to a BS, BMus, or related degree. The curriculum may include more business, technology, and science courses than the AA. Associate of Fine Arts (AFA) in Music: A practical degree that can prepare students for immediate professional work or transfer to a 4-year BFA program. Associate of Applied Science (AAS) in Music: A practice-focused degree that is often offered in areas such as music technology, sound production, and music business. This is intended for students who wish to go straight into the workforce after graduation. Performance/Composition: Music appreciation, music theory, performance techniques, practicums, etc. Music Education: Curriculum development, instructional methods, music therapy, evaluation techniques, etc. Music Business: Music industry, sound production, music marketing, etc. If you’re thinking of transferring to a 4-year school, concentrate on fulfilling the necessary general education requirements and taking rigorous music theory and musicianship classes. This will put you in a good position for your third and fourth years. You don’t need a bachelor’s degree to have a career in music. For example, in order to become a recording musician or sound engineer, you may only require an AAS or the equivalent. Associate graduates have also found work as musicians in performing arts companies, bands, and religious/civic organizations. On the other hand, if you’re interested in becoming a music teacher, music therapist, opera singer, or classical performer, you should be prepared to invest in a 4-year degree. A bachelor’s degree in music is a challenging 4-year undergraduate program that is designed to give students a comprehensive education in music theory and practice. Most bachelor programs are a mixture of general education requirements and courses in a music major. Baccalaureate programs are offered by a wide range of conservatories and traditional colleges/universities. A high school diploma or GED and proficiency in vocal work and/or instruments are required to apply. A lot of programs will require you to pass an audition before they accept you. A strong reputation in your field (e.g. jazz, contemporary music, classical, etc.). Ask your mentors, peers, and career advisers for their opinions. The BMus is an intensive, professional music degree. It comes in a variety of flavors, including performance, composition, technology, business, music production, and more. Regardless of its focus, the BMus is heavily concentrated on musicianship and performing, with rigorous courses in theory, history, and applied music. Recitals are often part of the third and/or fourth years. If you are thinking of becoming a practicing musician (instrument, voice, or conducting), you should be looking at the BMus or the BFA. Like the BMus, the BFA is an intensive music degree that is intended to produce professional musicians. Most of the curriculum is devoted to core courses in music theory and performance. As with the BMus, you may be expected to take part in performance ensembles and demonstrate your skills in recitals. The BME is intended for students who wish to teach music, either privately or in schools. In addition to fulfilling general education and liberal arts requirements, most BME majors are asked to specialize in a track (e.g. voice/choral, instrumental or general music). This training is supplemented with courses in areas such as music theory, music history, child psychology, classroom management, music technology, and conducting. The degree will include supervised student teaching experiences. If you’re interested teaching at the K-12 level and directing high school bands, orchestras, and choirs in a public school, you must have a state teaching license. We talk more about this in our section on state licensure. If this sounds like your kind of job, we recommend you earn a BMT from an AMTA-approved program. This degree will include core coursework in music, psychology, biology, social science, music therapy, and other classes related to disabilities, mental health, and medicine. BMT students are expected to be strong musicians with skills in a variety of instruments. You will also need to become board-certified after graduation – we talk more about this in our section on Music Therapy Certification. The BA is a broad liberal arts degree that mixes courses in music and musicianship with a wide variety of electives and general education classes. For the most part, the music requirements for a BA are much less stringent than the the BMus or BFA (1/4-1/3 of credits compared to 2/3-3/4 of credits). The BA is often pursued by students who have an interest in music (e.g. music business, music administration, arts management, etc. ), but who do not wish to become professional musicians. BS degrees in music are often offered by schools who wish to emphasize the technical or business side of the music industry. For example, you may find BS degrees with majors in recording technology, sound engineering, music production, and the like. BS degrees can also be offered in music education. In your search for programs, you may wish to consider a double or dual degree. This will allow you to combine your love for music with another relevant major (e.g. business). Universities that have music colleges or schools will often offer this option. You will also find some music conservatories have developed partner programs with universities (e.g. New England Conservatory + Tufts University). Be aware that a dual degree can take longer than four years to complete. Talk to your undergraduate adviser about your options. Instead of targeting one specific area, you may be able to combine classes in a minor (e.g. jazz studies) with a major in a broader field (e.g. performance). Interested in specialty areas such as library science? Hoping to teach music at a community college or university? Then you will need a graduate degree. The NAfME (National Association for Music Education) also recommends an advanced degree if you wish to work as a music consultant or music school administrator. Music therapists should have board-certification before applying to a master’s programs. Potential MMus students must often pass an audition. Master’s programs in composition may require you to submit a portfolio of scores and recordings of live performances. Students pursue a master’s degree because they are deeply interested in a field and/or wish to teach. Talk to your graduate adviser about your options. A master’s degree is not necessary for many music jobs. Master of Music (MM or MMus): A mixture of graduate-level coursework (e.g. music theory, music history, pedagogy, etc.) and intensive study in an area of specialization (e.g. composition, conducting, performance, music education, etc.). This is the baseline credential for music teaching positions at a university, college or conservatory. Master of Arts (MA) in Music: A general graduate degree aimed at students interested in careers related to music (e.g. arts administration). Music coursework might cover areas such as theory, musicology, ethnomusicology, and more. Master of Music Education (MME): A specialized degree often targeted at students who wish to teach music at the K-12 level. Coursework can cover areas such as music instructional techniques, student evaluation, teaching standards, musicology, and the like. If you are interested in this option, be sure your program is approved by your State Board of Education. Master of Music Therapy (MMT): An advanced clinical practice & research degree intended for board-certified music therapists. In the MMT, music therapists can deepen their skills in areas such as neurology, therapy, special needs, and medical disorders (e.g. multiple sclerosis, Parkinson’s, autism spectrum disorders, etc.). If you don’t have a bachelor’s degree in music therapy, you can look for degree equivalency programs in music therapy – these will allow you to complete preliminary coursework for the master’s without having to earn another undergraduate degree. Like the BMus, the MMus is focused on applied studies – i.e. intensive lessons, performance requirements, and working with a mentor. In addition to taking core courses in music theory, music teaching, and music history and specialized classes in your area of interest (e.g. Romantic-era violin, contemporary jazz, film composition, etc. ), you may be spending a lot of your time practicing your craft. In your final year, you will probably be asked to participate in a series of recitals (solo or with an ensemble), lectures, and showcases. Some programs will also require you to pass a comprehensive exam. All of this is intended to help you become a better musician and a qualified teacher/coach. Master’s graduates become professional musicians, conductors, and composers. They may work as high-level administrators in non-profit organizations, the government, and schools, or they may take up jobs in supporting fields such as therapy. A master’s degree in music is the minimum requirement for teaching instrumental or vocal performance at community colleges and conservatories. If you want a tenured position as a music professor, you’ll need to consider a doctoral degree. A doctorate in music is a 3-7 year advanced degree and the highest academic qualification you can achieve. Some universities offered combined master’s/doctorate programs for bachelor’s graduates. Other universities will expect you to hold a master’s degree before applying. Depending on your choice of program, you may be expected to submit a composition portfolio, provide examples of your expertise (e.g. live conducting), and/or pass an audition before you are accepted. DMA programs are open to candidates with a MMus, an MA, or a closely related degree. PhD programs in musicology or music theory are often targeted at candidates with an MA in music. However, some PhD programs are willing to consider strong candidates with a MMus in performance or composition, so it’s always best to check. Doctor of Musical Arts (DMA): Typically a practical/performance-oriented degree offered in concentrations such as performance (with sub-specializations in pedagogy or literature), composition, and conducting. Graduates become professional musicians and/or teach and conduct research in universities. Doctorate of Philosophy (PhD) in Music: Typically a research-oriented degree offered in concentrations such as music theory, music therapy, ethnomusicology, etc. Graduates are often involved in high-level research and university teaching. One thing to note – although we’ve provided broad guidelines, there may not be a great deal of difference between a PhD in Music with a performance track and a DMA with research components. Because the lines are so blurry between the PhD and the DMA, we recommend that you check with each school for details on the aims of the program. In your search, you’ll also find similar degrees such as the Doctor of Music (DM or DMus) and Doctor of Arts (DA) in Music. The DMA curriculum is made up of advanced coursework in music theory and history, applied work in an area of specialization (e.g. composition) and sub-specializations (e.g. computer programming), individual music lessons/mentoring, and independent research. Some schools may also expect you to take classes in a second language. During the first stage of your DMA, you’ll often be required to pass a series of comprehensive exams testing your overall knowledge (e.g. theory) and skills in your specialty (e.g. Baroque violin). After that, you’ll have more time to devote to original research. The degree usually culminates in a written dissertation, a research/capstone project, and/or lecture-recitals. If you’re interested in teaching, make sure your program includes opportunities for teaching assistantships and student lecturing. If you wish to become a tenured professor and teach music at a university, you should pursue a PhD or DMA in music. In addition to becoming academics, doctoral graduates work as researchers, administrators, conductors, and composers. Because this is a research-based qualification, most practicing musicians don’t bother with the PhD or DMA. A certificate in music is a non-degree academic qualification that takes ~6 months-1 year to complete. Like a minor in a conventional degree program, certificates are intended to provide students with specific skills in an area of music studies. Depending on the focus, some certificate programs will ask you to pass an audition. Undergraduate Certificate: Targeted at aspiring undergraduates who are considering a bachelor’s in music or current undergraduates who wish to prepare for graduate study, gain performance experience, and/or explore specific areas (e.g. composition). Graduate Certificate: Targeted at baccalaureate holders who are interested in acquiring new skills (e.g. digital music production, music education, etc. ), earning course credits for a master’s degree, and/or advancing their job prospects. As a rule of thumb, we suggest that you look for schools with regional accreditation. This is a “seal of approval” granted to institutions (e.g. non-profit and public colleges and universities) by one of six regional accrediting bodies (e.g. Southern Association of Colleges and Schools). Music conservatories are eligible for regional accreditation. Regional accreditation only applies to a college or university, not to individual music degrees or programs. If you’re concerned about the quality, you may wish to see if the music school has NASM accreditation. Music therapists can search for AMTA-Approved Schools. Established in 1924, the National Association of Schools of Music (NASM) sets national standards for undergraduate and graduate degrees and other credentials in music education. In order for schools to participate in Title IV funding programs, institutions must be accredited by a recognized institutional agency (e.g. Higher Learning Commission). That means some independent schools of music have opted for NASM accreditation. It’s not necessary to go to a NASM-accredited school to get a good education. Some very well-known schools, including the Juilliard School, the Yale School of Music, the New England Conservatory, and the University of Southern California have opted out of NASM accreditation. But it may help in your decision. Search for a NASM-Accredited School. The American Music Therapy Association (AMTA) offers its seal of approval to undergraduate and graduate programs in music therapy. However, only academic institutions that are regionally accredited and accredited/affirmed by the NASM are eligible. Schools applying for AMTA approval must meet a set of quality standards, including academic and clinical competencies. For example, bachelor’s programs in music therapy must provide 1,200 hours of clinical training, including a supervised internship. In order to become a board-certified music therapist, it’s important to earn an AMTA-approved degree. This will set you up for the MT-BC credential. Search for an AMTA-Approved School. If you’d like to teach K-12 music in a public school, you must have a state teaching license. (Private schools may not require state licensure, but they’ll generally expect you to hold a degree.) We discuss the licensure process and the importance of NCATE and TEAC accreditation in our article on K-12 Education Degrees. Earning a Bachelor of Music Education (BME) from a regionally accredited bachelor’s program that incorporates supervised teaching experiences/internships into the program. This is the most straightforward way to get into teaching. Pursuing another bachelor’s degree in music (e.g. BMus, BA) and enrolling in a teacher certification program after graduation. Completing a master’s degree in education or music education and fulfilling licensure requirements. Some schools require music teachers to hold a master’s degree. Please be sure to check with your State Board of Education for exact details on licensure before you enroll in a music education program. You want to make sure your state will recognize your degree. You may also wish to visit the website of the National Association for Music Education (NAfME). It has a wide variety of resources for teachers and administrators. Unlike state licensure, professional certification from the Music Teachers National Association (MTNA) is purely voluntary. However, deciding to become certified as a Nationally Certified Teacher of Music (NCTM) shows employers that you have committed to maintaining a set of high educational standards. MTNA certification is available to music teachers who teach at any age level, in any setting (private or group). The certification process can last up to one year, and involves the submission of five teacher profile projects. Certification must be renewed on a regular basis. In order to work as a music therapist, you should be certified to practice. The most straightforward path to certification is to earn a bachelor’s degree – or higher – from an AMTA-approved college or university program. Once you have your degree in hand, you can take the national board certification exam from the Certification Board for Music Therapists (CBMT). This is the only organization to certify music therapists to practice music therapy nationally. If you pass this exam, you will be granted the MT-BC (Music Therapist – Board Certified) credential. You may come across CVs of current music therapists that list professional designations such ACMT, CMT or RMT. These board certifications were issued by the former American Association for Music Therapy (AAMT) and are valid until 2020. They have all been replaced by the MT-BC credential. In other states, you may wish to consider applying for a license in general therapy/mental health. Examples of these include the Licensed Professional Counselor (LPC) and the Licensed Creative Arts Therapist (LCAT). But be aware that they won’t be music-oriented.